Tonality, the underlying principles of tonal music, is both an elusive and pervasive property of the music with which we are familiar. Elusive because its effects can be felt without the mind being consciously aware that it is actively construing the pitch relations that define tonality; and pervasive because it underpins most of the music that we hear. Its effects can be quickly demonstrated by the ability of the listener to sense when a piece has ended: try humming only the first three phrases of “Happy Birthday.” The chapter begins by motivating the study of tonality from the practical standpoint of the listener and of the music practitioner, namely the performer and the composer. It then proceeds to describe the genesis of the project in the pianolab of MIT, when a student asked, “What do you mean by key?,” reflecting on what it is that allows a listener to ascertain the most stable pitch in a sequence. 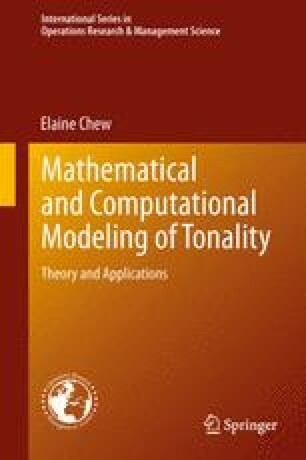 In the spirit of Bugliarello’s new trivium and quadrivium, in which “no domain can any longer be considered and learned in isolation,” the chapter describes how the book bridges the disparate disciplines of music theory and operations research. Spanning C.P. Snow’s two cultures, the book mixes mathematical formalisms with qualitative descriptions, mingling intimate and subjective case studies with impartial large-scale and quantitative testing of algorithms. The chapter proceeds to trace the development of the Spiral Array model from its inception through the applications that have followed, thereby providing a narrative of the remaining chapters of the book and the way in which they are interlinked.